We guarantee the lowest prices allowed on all Osaki, Titan, and Apex Massage Chairs. 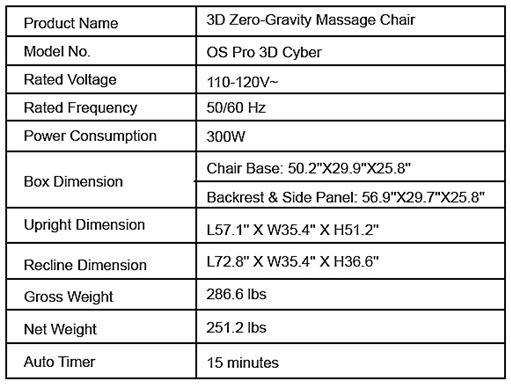 The Cyber Massage Recliner is virtually bursting at the seams with the latest in comfort technology. Let us ship and deliver your new Pro Cyber Chair at no additional cost to you. That's right, you pay for your chair and we will deliver it for free. These chairs are dreamt up, designed, and expertly engineered to maximize your comfort and the overall function of the chair itself. Osaki products are put through rigorous, heavy testing to ensure reliability and performance, day in and day out. Come and experience the Osaki difference and we guarantee you will be glad that you did! Read below to learn the basics about the many beloved functions of the PRO Dreamer Massage Chair by Osaki. You can also call 888-486-9463 to speak to an Osaki Brand Specialist or pop by one of our retail locations to take a chair for a test drive. 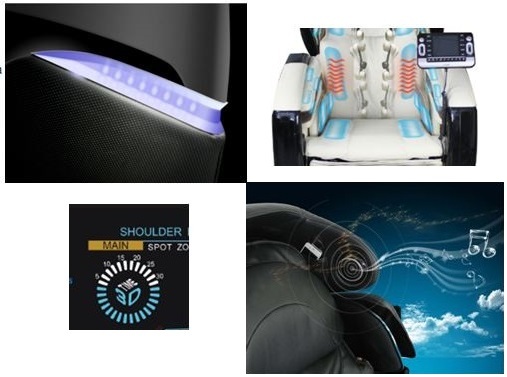 3D Massage Technology Capabilities- Osaki has taken the latest in comfort and massage technology to bring you enhanced 3D Massager capabilities. The 3D aspect means that the mechanical arms actually come out of the seat and towards your sore muscles nearly 8cm. This ensures the deepest tissue massage possible in a massage recliner chair. Pair this with a body scan and you have a wonderful relaxation tool that assesses your body and adapts to its needs. 3 Dimensional Massager reach allows you to increase or decrease the strength of the massager. This means you can accomodate your most tired and sore muscles with a customized experience. Computerized Body Scan- At the onset of each massage session, your Osaki Massage Chair is equipped to perform a scan of your body. 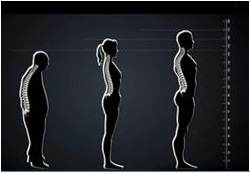 Proper scanning of your back ensures that the mechanisms target specific areas and are adapting to your body and your needs. After all, no two people are alike. Why would you settle for a massage chair that thinks everyone's back is shaped exactly the same? As you initially enter your chair and begin a massage session, we recommend utilizing the body scan feature to ensure the highest levels of comfort are achieved, during each and every session. 2 Stages of Zero Gravity Positioning- The science behind Zero Gravity positioning in healthy-furniture is not a new development. Researchers and comfort engineers have long understood that in order to truly unwind and relax, your body needs to be completely supported and positioned optimally. Zero Gravity positioning enhances blood flow to areas of soreness, reduces discomfort associated with unnatural positioning and helps to release tension from stiff muscles. 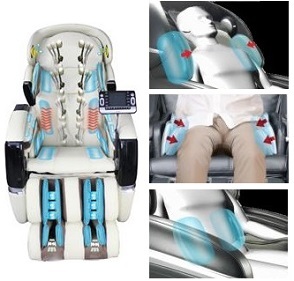 The dual stage Zero Gravity positioning ensures that your body will not only begin to unwind but the effects, spinal decompression, increased ease of blood flow, etc., will be felt nearly immediately as the body begins to relinquish control and allow the Osaki Massage Chair to improve your comfort and well-being. Air Bag Massager Capabilities- Compression, squeezing, stimulating pressures... Osaki Massage Technology is not innovating but also improving. The Air Bag Massage Function allows strong air bags to compress, squeeze, and stimulate your hands, arms, shoulders, hips, legs, and feet. This approach has often been found to be less physically taxing as mechanical arms and therefore adds a new element to the massage and ultimately towards improving your health. Osaki has even streamlined the number and placements of the air bag massager components to ensure an optimized experience and increased longevity of your chair. In addition to the compressional massage, the air bags function during the stretching modes to anchor and comfortably stretch your hips, waist, legs, and shoulders in a therapeutic fashion. In an increasingly sedentary world, it is important we incorporate at least minimal stretching into our daily routines. This promotes well-being, increased ease of blood-flow, and more. Key areas prone to a lack of stretch and regular activity include our shoulders, upper thighs, and lower backs. Decreased physicaly activity can lead to susceptibility to many physical ailments. The next function to mention is the Hand and Arm Massagers. These air bags are incredibly precise at securing, massaging, and stimulating your 2 most over-worked body parts. The arm compartments are lined with a soft and durable Spandex type upholstery that allows for seamless stretching and flexing for years on end. The actual air bags feature a "dimpled" side with raised bumps to increase and concentrate tactile stimulation of your forearms. The massage programs feature extended compressional pressure, alternating activation, and much more. This is incredibly important at increasing biofeedback and encouraging relaxation of a group of muscles that are used daily for extended periods of time. Foot Massaging Dual Rollers- The enhanced seating wells for your feet and calves ensures you have a Massage Experience in your brand-new Osaki Massage Chair. The Dual Roller function acts in conjunction with the compressional air massagers to stimulate nerve endings and soothe tired muscles. Comfort and tend to your aching calves and increase ease of blood flow to your feet. Pair the Zero Gravity Function with the Foot Massaging Capabilities and you have one of the best foot massages around. In addition to the computerized body scan, there is also a Leg Scan. This ensures that the massagers concentrate on the appropriate areas for your specific height and build. Customized Comfort is the wave of the future. In case you are still undecided, these are some of the best massage chairs available. They are also readily stocked for immediate shipping. Why wait or settle for the rest when you can have the best quickly? This amazing model not only features the latest in actual massaging technology but is practically loaded down with additional features that ensure you a relaxation experience like no other. LED lights along the sides of the chair promote a soothin blue aqua environment. Turn the lights down and turn the LED feature on to enhance your massage with Chromotherapy. Relax and Unwind with your eyes closed or open; there is a feature for you. Stimulate your muscles, release stored toxins, and ease knots with the lower back warming function. This entire chair is designed to cater to your every comfort need. This is also why it features Mp3 connectivty. Connect your favorite digital media device and promote a total sensory relaxation experience. Adjust the volume to a safe and comfortable level and you can drown out distracting stimuli from the world around you and truly drift off and leave the world behind. Massage has been shown to improve your comfort, relaxation, and overall well-being. It is important to remember to practice in limited increments. These models come with a built-in Auto-Timer to ensure you spend the appropriate amount of time per day soothing and relaxing without going overboard and losing track of time. Product Dimensions: Please see card below for shipping and assembled dimensions for this product. When you are ready to order, simply drop us a line at 888-486-9463 or you can order here securely 24/7. A dedicated team member will contact you prior to shipping, to schedule a delivery date/time that is most convenient for you. Love the intensity and the variety of massages this chair can preform!